Don't miss the chance. Come and take part in the annual innovation and entrepreneurship event for higher education institutions. Entrepreneurship group welcomes graduates, joint participation of academic staff and students. 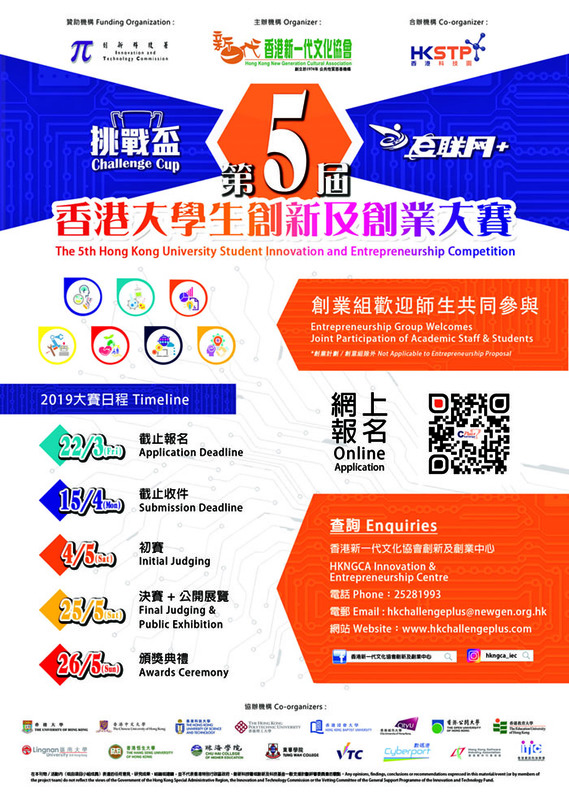 The winning Innovation Projects will continue to represent Hong Kong in the "Challenge Cup" National College Students’ Extracurricular Academic Science and Technology Contest（「挑戰盃」全國大學生課外學術科技作品競賽）which is recognized as the “China Youth Innovation and Entrepreneurship Olympic” while the winning Entrepreneurship Projects will enter the “China College Students’ “Internet Plus” Innovation and Entrepreneurship Competition”（「中國聯網＋」大學生創生創業大賽）, which is known as “The Best and Biggest Roadshow Platform Worldwide”. All Categories: Hong Kong full time diploma, higher diploma, associate's, bachelor's, master's and doctoral degree students (on-job postgraduates exclusive). Category (B)2 and (B)3: Eligibility listed above, or graduates within 5 years, or cooperative projects with academic staff and students. Top winners will represent HKSAR and their colleges in the “Challenge Cup” and “Internet +” National Contests at Beijing and Hangzhou respectively.